A 25 yr old bipolar patient of mine was put on metformin and a weight loss program prior to hip surgery. Her mood was more stable and she noticed particularly fewer manic episodes. There is evidence in literature for metformin helping bipolar cases. Bipolar, particularly those inherited from mother, could be more likely a mitochondrial disease, and recent developments suggest metformin with weight loss is a mitochondrial metabolic enhancer. Given metabolic syndrome is almost universal in bipolar, should metformin be universally used? Day after I wrote this up, I had a Bipolar victim come in refusing to take any stabilizing meds because she would put on 30 lbs. Metformin then became a serious option. 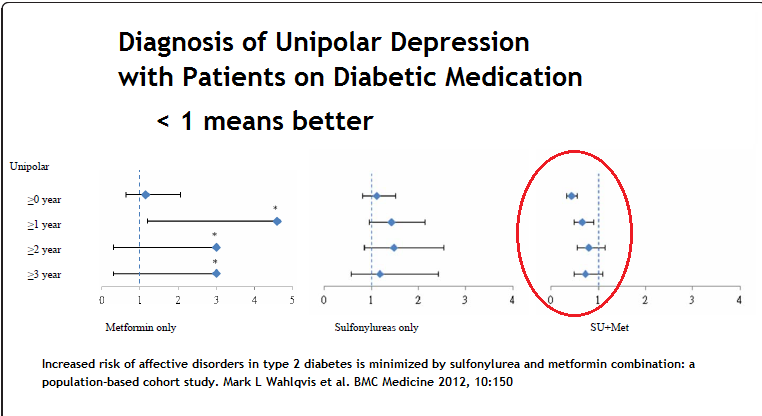 Results metformin reduced bipolar diagnosis rates while other diabetic med (sulfonylureas) did not. Interestingly, in unipolar depression, only the combination of metformin with other meds was effective. The fact that those on combination pills had less depression is more difficult to interpret as the diabetic disease is more advanced and other factors could be involved. Ren-Rong Wu, MD; Jing-Ping Zhao, MD, PhD; Hua Jin, MD; Ping Shao, MD; Mao-Sheng Fang, MD; Xiao-Feng Guo, MD; Yi-Qun He, MD; Yi-Jun Liu, MD; Jin-Dong Chen, MD; Le. With these factors in might, one could make a case for all bipolar victims being put on metformin and a weight loss program not only for weight, but for its mitochondrial enhancements. Its cancer preventative effects are well known. This entry was posted in Depression, Drugs. Bookmark the permalink. I’m using ketogenic diet to support (and maybe eventually supplant) my meds for bipolar1. Love the idea that metformin will provide further support. I’m wondering, since berberine supposedly mimics the effects of metformin, do you know if it might have the same benefits in this context? I’m doubtful I’ll be able to get a prescription for metformin, so I’m wonderinf if there’s a nonprescription alternative. Sorry, I don’t think there is anything quite like it. I take it for its anti-cancer effects. I have some bipolar victims on metformin to help cut weight gain that many get taking atypical like quetiapine or zyprexa. I can’t believe my good luck having done that, because in retrospect, they are more stable. If you show that reference to your doctor, you might persuade him/her to put you on it just for weight.